In this tutorial, I will guide you trough the HAProxy installation and configuration for 3 servers, one load balancer, and two Nginx web servers. We will install HAProxy on a single server and then install Nginx web server on the other servers. HAProxy acts as a load balancer for the Nginx web servers. HAProxy can run in two modes: TCP mode Layer 4 and HTTP Mode Layer 7. In Layer 4 TCP mode, HAProxy forwards the RAW TCP packets from the client to the application servers. In the Layer 7 HTTP mode, HAProxy is parsing the HTTP header before forwarding them to the application servers. In this tutorial, we will use Nginx as the web server that only supports the Layer 7 HTTP mode. This is the most simple balance algorithm. For each new connection, it will be handled by the next backend server. If the last backend server in the list is reached, it will start again from the top of backend list. The new connection will be handled by the backend server with least amount of connections. This is useful when the time and load of the requests vary a lot. There are oOther algorithm - check the official HAProxy site for details. Root privileges on all 3 servers. Log in to the load balancer server and edit the /etc/hosts file. do this on nginx1 and nginx2 server. user        haproxy             #Haproxy running under user and group "haproxy"
Next, configure rsyslog for HAProxy. We will configure the rsyslog daemon to log the HAProxy statistics. Edit the rsyslog.conf file to enable the UDP port 514 to be used by rsyslog. In this section, we will install Nginx from epel repository on nginx1 and nginx2 server. Make sure you're doing this step on nginx1 and nginx2 server. 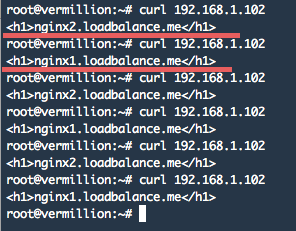 HAProxy is working successfully and acts as a load balancer for our two Nginx web servers. HAProxy or High Availability proxy is an open source software that provides high availability for TCP-based services, it operates as HTTP load balancer and proxy server. The software is written in C and supports SSL, keep-alive and compression. HAProxy is the right choice for everyone who needs a load balancer and proxy server that is fast and lightweight with a small memory footprint and low CPU usage. Haproxy can run in Layer 4 TCP mode and Layer 7 HTTP mode. Nginx supports only the Layer 7 HTTP mode with HAProxy. If you want to use Layer 4 TCP mode, you can use other web servers like apache. On CentOS 7, HAProxy is available in the default repository. It's easy to install and configure. When i was testing by browsing to the load balancer's IP: It just display nginx1 even when i pressed F5 many times. Check your haproxy log and configuration. On my vm centos7 - this tutorial is work perfectly.. Thanks a lot dude!! It works! Hi, Looks good article. Can I get the same step by step procedure for SFTP load balacing with HAProxy Pl.I need this on priority. this is not working for me. the haproxy stats shows my servers are down and logs show no server avalible when i start haproxy. I can only open the web app on the machine it is set on. nginx1 only opens on nginx1. I thinking it has something to do with my hosts file or host names but im not that good at linux. Under the HAProxy balance algorithm, it should be leastconn and not lastconn for the description you have given.